Live To Eat, or Eat To Live? Both! Good news: After reading the preceding chapters, you’ve decided to reduce fiber in your diet. Bad news: It’s not going to be easy. As this book explains time and again, fiber is an addictive substance. Good news: An addiction to fiber is easier to break than an addiction to drugs or cigarettes. 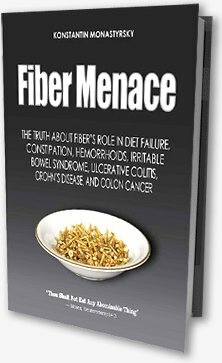 Bad news: If you’ve been using fiber as a laxative for some time, or have a history of chronic con­sti­pation, it’s not going to be as simple, because your colorectal organs have been irreversibly transformed by large stools and straining. Good news: Fortunately, it’s possible to gradually overcome most of the obstacles presented by colorectal damage. Bad news: Unfortunately, you’ll need to make a lifelong effort to manage this situation. Imagine the promise of a spectacular and permanent weight loss, and then the disappointment experienced among people who failed on the Atkins or South Beach diets because of constipation, indigestion, hypoglycemia, dehydration, and other “side effects” of reduced fiber diets. This book can malign fiber all it wants, but what good will it do if fiber addiction can’t be broken without these debilitating conditions? Chapter 11, Avoiding the Perils of Transition, explains the causes behind the fallout of fiber withdrawal, and describes key strategies for a crash-free transition from a high- to low-fiber lifestyle. This brings us to the final chapter. Humans are extremely vulnerable to just about anything out of the ordinary: heat, cold, fire, smoke, darkness, slippery surfaces, and so on. The natural, innate fear of trauma and death keeps most of us away from these types of perils. Not so with health—as a rule, most people don’t value it until they no longer have it. Inversely, the value of health becomes palpable when we first begin experiencing diseases, especially those that cause pain or defy a quick fix. Chapter 12, The Low-Fiber Advantage, enumerates the key benefits of excising fiber from your diet. Those benefits range from weight loss and improved digestion to recovery from diabetes, indigestion, irritable bowel syndrome, Crohn’s disease, and ulcerative colitis—disorders that defy conventional treatment because drugs can only sugarcoat their symptoms, but can do nothing to remove their causes. Fiber is the champion of harm among these conditions. This chapter often refers to a low-fiber lifestyle rather than just to a low-fiber diet for a reason: who can really diet for long? Besides, this book isn’t about what to eat. It’s about what not to.